New Melbourne Browncoats, Inc. | Ever dreamed of creating Kaylee’s fluffy ruffled dress from Shindig? Here’s a guide to get you on your way! Joss Whedon’s “Agents of S.H.I.E.L.D.” premieres in Australia today! Got some spare time? Want to help us out and have some fun? We’re looking for volunteers! Ever dreamed of creating Kaylee’s fluffy ruffled dress from Shindig? Here’s a guide to get you on your way! Armageddon Expo is coming soon to Melbourne, and this is a great opportunity to show off your Browncoat spirit with cosplay! One of the most coveted Firefly cosplay outfits is Kaylee’s ruffled pink dress from the episode “Shindig”. It’s also one of the most difficult and time consuming costumes to create, but it can be well worth the effort! If you’ve taken on the fluffy dress challenge, let us know! We’d love to share your photographs and learn how you managed to make this most difficult of Firefly costumes into a reality! One US cosplayer, Caitlin, has kindly shared some very detailed instructions on how she created her version of the dress. You can find Caitlin’s costume guide here, and a great collection of reference photos (including some behind the scenes pictures provided by Trpcic) here. 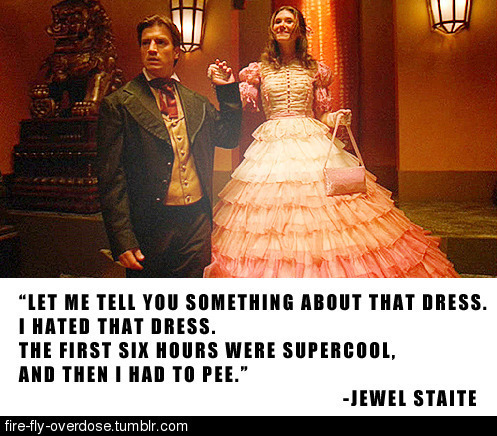 But be warned… it’s not all fun and games, as Jewel Staite discovered!